For the safety of all dogs as well as their owners, please look for and observe the dog park rules and regulations which are posted upon entering the dog park area. No food of any kind is permitted in the dog park. Smoking is not permitted within the fenced areas. Large dogs (over 30 lbs.) are not permitted in the small dog area. Dog feces must be cleaned up by handler. Disposable bags are available at dispenser locations within the park. Dog handler must be in the park enclosure and within view of their dog. Dogs must be leashed prior to entering and upon leaving the dog park and must be restrained at all times at a distance no greater than six feet in length from their handler. There is a limit of 2 dogs per person. 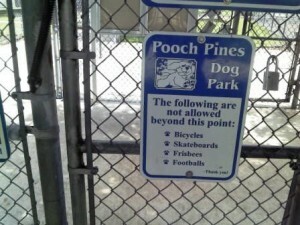 Dogs must be removed from the park at the first sign of aggression. Dangerous dogs, as defined in Palm Beach County Ordinance No. 98-22, the Palm Beach County Animal Care and Control Ordinance, are prohibited from park property. Dog handler must have leash in hand at all times. Female dogs in heat are prohibited from entering the dog park. Dogs should be under voice control (i.e. come when called). Dogs must be vaccinated and display current licenses. Puppies under 4 months of age are prohibited. Children ten years of age and younger must be closely supervised by an adult.